Once again, thanks to I'm a Reader, Not a Writer and Mundie Moms, I've another giveaway for you guys :) There's tons of other blogs participating as well so make sure you check out the rest of them but clicking at the image above or the link below after the raffle copter. Paperback Book Of Your Choice. Giveaway is International. as long as The Book Depository ships to you. Prize is a paperback copy of a book of your choice, so make sure the book you want is available in paperback. Make sure you check out the rest of the blogs participating in the hop here! 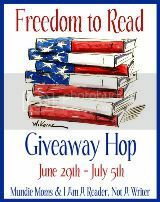 Love the hop title, freedom! Thanks for the giveaway again.